Coded 'Yellow 6' of JG400. Surrendered at Husum and shipped to the RAE. Despatched from Farnborough to No. 6 MU Brize Norton on 21st July 1945. With No. 6 MU in the Home Census of Aircraft on 21st march 1946 and despatched to No. 47 MU Sealand, on 17th June. In 1949, was with the GAFEC, No. 3 MU Stanmore Park, remaining there until at least 1955. At this, point the picture becomes confused in that 191316 is the aircraft now in the Science Museum while 'AM 210' is reported as the aircraft which presented to the Deutsches Museum at Munich by the RAF in April 1964. It may, be that 191316 was not AM 210 as postulated but in any event it would appear that the Air Historical Branch held two different Me 163s, one of which went via Holton to the Science Museum, and the other via West Raynhom and Messerschmitt-Bolkow-Blohm to the Deutsches Museum at Munich. It is possible that 191316 was AM 210 and that the Deutsches Museum aircraft was another so far unidentified Me 163B which was transposed with AM 210 during storage. These aircraft were frequently displayed at RAF 'At Home' days ond other events, and since their 'Air Min' numbers were painted on their storage crates but not on the aircraft themselves, it would not be difficult for their true identities to be lost. Any readers with confirmed sightings of Me 163B's at displays in the 1945 - 1964 period who can clarify the true Werke Nummern of particular aircraft are invited to contact the author! The article Klassiker der Luftfahrt: Me 163 - Heimkehr eines Raketenjägers shed some light on the RAF history of this aircraft. It was captured at Husum, where it was part of Jagdgeschwader 400. Not much is known of its history, and even the Werknummer 120370 is just a guess. It was test-flown without an engine (or engine power). Several parts had been replaced, for example it had a Spitfire control stick. It was damaged after its last flight, having somersaulted several times. The location of these flights is yet unknown. The photo below shows the future Deutsches Museum Komet being loaded on a Noratlas, at RAF Biggin Hill in 1964, on its way from the UK to Germany. The article Klassiker der Luftfahrt: Me 163 - Heimkehr eines Raketenjägers has a short article on the return of this Komet (possibly a reprint of Flug Revue issue 10/1965). The RAF decided to return one of its captured Komets to Germany as a gesture of goodwill. The aircraft was provisionally repaired by RAF mechanics. Air Commodore R. Deacon Elliot presented the aircraft on 28 November 1964 to the German delegation lead by Brigadegeneral Streib. The Luftwaffe took care of the repatriation, using a Noratlas to fly it to Ingolstadt-Manching on 1 December 1964. The December 1964 issue of 'Jãgerblatt' contains an article on the transfer of this Komet. Among others it reports that the handover on 28 November 1964 took place at Biggin Hill. Former Komets pilots present were Reinhard Opitz, Franz Woidich, Fritz Husser, Hans Peters and Mano Ziegler. The German mechanics under command of Willi Radinger (a former Komet mechanic) started preparations for the transport the same day. The article says the transport flight took place on 3 and not 1 December 1964. The colors applied during the restoration were on the yellow side according to the memories of the experts. 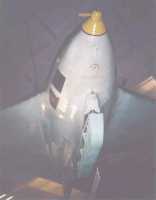 Some non-origonal parts indicated that the aircraft had suffered a bit during the towed and unpowered test flights in the UK. The fairing between fuselage and cockpit (not sure what is meant there) and the prop-driven generator were among them. Also the instrument panel was incomplete, but Reinhard Opitz donated his carefully collected instrument panel to solve that problem. It reports that this was a former operational JG400 aircraft. The cover photo shows some of the strange markings applied at Biggin Hill, and part of the camouflage pattern on the left wing. The Messerschmitt (MBB) factories at Manching and Augsburg performed an overhaul, adding the missing parts with originals from all kinds of sources, finishing the work in the spring of 1965. The Komet came to Germany without an engine, but later one was shipped from the UK to complete the aircraft. It was painted as an aircraft of 7./JG400, but the camouflage and markings do not look authentic unfortunately, with the huge mottles and wrong iron crosses. The official handover to the Deutsches Museum took place on 2 July 1965 in the presence of many involved in its development: dr. Alexander Lippisch, professor Hellmuth Walter, professor Messerschmitt, and many pilots and others from the times at Peenemünde and Bad Zwischenahn, including Oberst Streib, Rudolf 'Pitz' Opitz, Mano Ziegler, Dr. Dunker (doctor of EK16), Dipl.-Ing. Boye (technical officer of EK16). Captain Eric Brown, the British Air Attache in West-Germany, and Dr. Benecke were also present. Willy Messerschmitt gave a speech. See the article Klassiker der Luftfahrt: Me 163 - Heimkehr eines Raketenjägers for photos. The photo below shows Captain Eric Brown in the cockpit of the Deutsches Museum Komet, with press attending. The photo was kindly supplied by Joe Grasela. According to Deutsches Museum, the Komet carries a wrong camouflage scheme and markings, and the Werknummer is not exactly known. It hangs above Me 262A-1b 'White 3' WNr 500071. Komet photography expert Ludo Kloek paid a visit to the Deutsches Museum in July 1999 and made the following photographs. The lighting conditions are pretty poor in the museum, and I used gamma correction to make details better visisble. This explains the grainyness of some of the pictures. Reconstruction work at the main facility of the Deutsches Museum in München city made a relocation of many aircraft necessary, and they are now on display at the Flugwerft Schleissheim facility. Mid-December 2015 they were available for the public again. A positive aspect is that the Komet is now standing on the floor instead of hanging from the roof. Klassiker der Luftfahrt: Deutsche Jäger wieder vereint has a short article on the move.